Franz Kafka has an interesting family life. He was the eldest of six children, and his father ruled his house. Kafka's relationship to his father was troubled. He viewed him as authoritarian, and even abusive, which had a tremendous impact on his writing. Later in his life, he wrote a 45-page letter to him trying to bridge the gap between them. This letter was so poetic, that Max Brod, Kafka’s publisher and friend from the time they studied together at university, published it after his death. In 1917, Kafka developed Tuberculosis and had to be supported by his family, most often his sister. Throughout this period, he had a tremendous fear, as written in his diaries that he would be perceived as physically and mentally repulsive by all who he met. These experiences proved to be key in influencing his writing of The Metamorphosis, as the story is almost biographical. On June 3, 1924, Kafka died from the illness. A posthumous letter to Max Brod stated "Dearest Max, My last request: Everything I leave behind me to be burned unread." Lucky for us, Brod ignored his request. Kafka published very little while he was alive, and even then only short stories, among them The Metamorphosis. This was his only major work he finished, leaving most of his full-length novels such as The Trial and The Castle, unfinished. There is tremendous debate in the field of literary criticism as what to properly label Kafka and his writings has. Some maintain he was an existentialist, a modernist, a magical realist, a secret Zionist and so on. Milan Kundera claims Kafka as a main predecessor of artists like Frederico Fellini and Gabriel Garcia Marquez. Kafka identified himself as a German living in Prague as opposed to a Czech, and composed all his literary works in German. The structure of his writing in German allows for sprawling sentences that can take up pages at a time. A major theme in Kafka's writing, and subsequently writing style, was mystery. Many characters are unnamed, and character objectives and major plot points go without explanation, such as Joseph K.’s need to get into the castle, or Gregors reasons for turning into an insect. Kafkas writing style is filled with mystery, as he tended to use words that could be translated into a plethora of meanings. Most specifically is the word Ungeziefer in middle German. Kafka uses this word to describe Gregor Samsa, or more specifically, what he transforms into. The word literally means, animal unsuitable for sacrifice, yet English translators tend to convert it into “insect”. Kafka had no intention of labeling Gregor, simply capturing the emotions of the world, and Gregors own revulsion at his transformation. Kafka’s lasting literary legacy still influences artists the world over. There is a saying literary critics like to throw around. “To the Czechs he was a Germans, to the Germans he was a Jew.” This is in reference to the reluctance of those two countries to take national pride in Franz Kafka and his writings during the days of the Holocaust and World War II. Franz Kafka’s official Jewish education never progressed past his Bar Mitzvah and quadri-annual trips to the synagogue with his father, which in diaries he expressed hatred for. Many claim that Kafka was a fervent, secret Zionist, perhaps so secret that he himself did not know he was one. 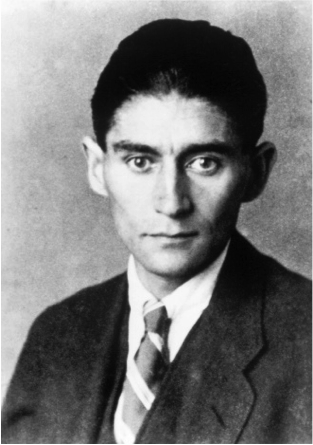 Kafka did not translate his Judaism into his work, however. There are no explicitly identified Jewish characters in his works, though his life was rife with it. In 1912, five years before he contracted tuberculosis, Kafka found an interest in Yiddish theater, taking to the stage just like the “2011 Edinburgh Company”. Many of his closest friends, including Max Brod, supported him in most of his endeavors, but he, shall we say, got less than phenomenal reviews. This passion for Yiddish theater served as the basis for his renewed interest in Judaism in his adult years. He lived in Berlin for a while with a lover, Dora Diamant, a kindergarten teacher who gave him inquisitiveness in the Talmud. He also left some of his works with Diamant, and requested she burn those papers after his death as well. She also ignored the request and in 1933, the Gestapo confiscated the papers. Currently, an international search is being held for them. After his death, Kafka was buried in a Jewish cemetery, a final resting place far preferable to that of his sisters and their families, who died in the Lodz ghetto. His sister Ottla, who many consider to be the model for Grete in the Metamorphosis, however, was sent to Theresienstadt in 1943, and then Auschwitz, where she, 1267 children and 51 guardians were gassed almost immediately. As you can see, this is why Kafka is one of my favorites, and by far the most interesting author to work with. Even with all of this information at our disposal, we have barely scratched the surface. With such themes as moral ambiguity, sub-humanity and sheer and utter mystery to wrestle with, we have our hands and our minds full every second of every rehearsal, and I wouldn’t have it any other way.